BTCW Chris KILPATRICK JD 1st 16 month old bull type, white with black brindle ears, powerful and compact, super well filled head, deep and wide, ears a little wide set, keen expression, correct mouth, muscular neck, straight front with strong round bone, good quarters. 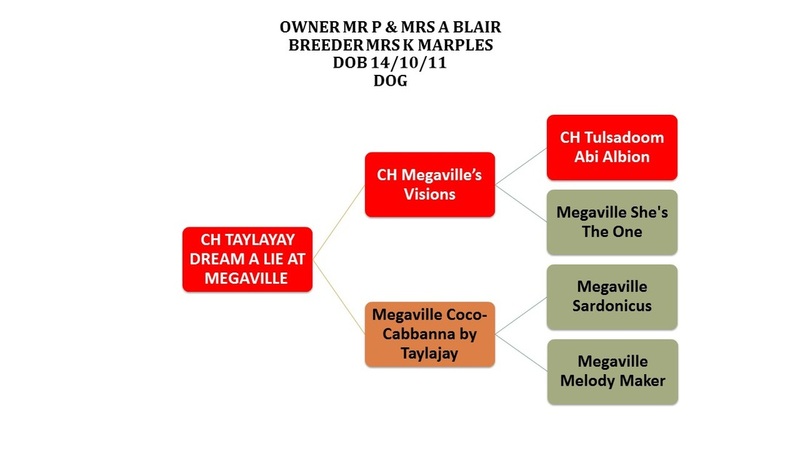 Moved with drive both ways, a fitful showman who makes his handler work hard, a little out of coat, but a useful stud dog. CRUFTS David MERRIAM JD 2nd White with brindle ear marking. A moderate head. Very adequate bone and substance. Not the lines of 1. Rather straight in shoulder and stifle. Shown well. NAT TERRIER Carole KILPATRICK JD 1st A nineteenth month old white dog with black brindle ears. A bull type with strong powerful head, good expression, ears a little wide, strong neck into front, good quarters, short back, moved well both ways, a little out of condition on the day. BIRM NATIONAL Brian HILL JD 1st A nineteenth month old white dog with black brindle ears. A bull type with strong powerful head, good expression, ears a little wide, strong neck into front, good quarters, short back, moved well both ways, a little out of condition on the day. SKC Mark PHILLIPS OD 2nd Quality cobby compact white dog with black ears. His head is filled up and has profile and finish with good expression. Good mouth. Straight front with good bone and neat feet. Moved better coming than going away. Super showman, pushed hard for the Res CC but would have preferred less weight on the day. BLACKPOOL Jan DYKMA LD 1st White dog with black ears. Impressive bone and substance for his size. Classical head with no dips or hollows. Smooth throughout. Bite good. Ears could be set more upright on his head which would improve all over keenness of expression. Viewed front on he is substantial and stands well over himself. Feet are tight. Side view shows a neck that flows to well laid shoulder and decent length of back. Moved bullish coming and a bit close going away. All in all a very nice dog. Close call between this dog and the RDCC dog. SBTC Sarah FOSTER LD 1st Quality masculine white with black ears. Lovely head being completely arced and filled. Good mouth, ears could be better placed, good eye, excellent bone, straight front and tidy feet. Short backed with shapely quarters, moved ok holding his topline. 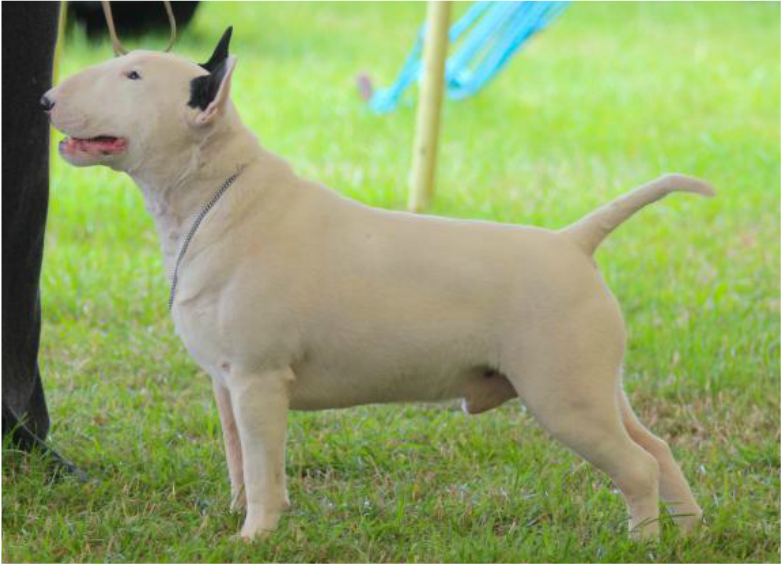 NPBTC Eddie BALL LD 1st White with black brindle head markings, quality dog that has a powerful head that has width, turn and finish, his profile is unbroken, correct mouth, beautiful neck into well laid shoulder, straight front with lots of bone, tight feet, he has a level top line and is short backed. Rear angulation is very good and he has strong powerful quarters that give him drive and he covers the ground with ease. CITY BIRMINGHAM John YOUNG OD 2nd White dog with coloured ears, Head turned and filled, ears could be better set, level topline, short back, good tail set, good bone and substance, I would like a tad more length of leg, showed and handled well.